Group discussion of Joe’s maple at last session. I know many of you are still making New Year’s resolutions to, perhaps, trim yourself a bit as well as trimming your trees. Or moving more while you prune to satisfy your new rigorous exercise regime. Maybe you’ve even decided to read more bonsai books this year so you can see where it all went wrong. Well, another great way to start 2018 is to attend our first Club meeting of the year. You could even bring all those holiday cookies you’ve sworn not to eat. Or all those expensive bottles of bourbon you’ve given up. But one thing to be sure to bring is one (or more) of your trees that you would like expert opinions on. Expert, at least until we start drinking all that whiskey. Seriously, we are having a members’ critique session on Tuesday, January 9th at our usual location — The Goleta Valley Community Center, 5679 Hollister Ave, Room 7. This is always a fun, lively session with great advice on the next step you should take further develop your tree. Last session, for instance, I brought in a struggling juniper. It was suggested that I might be over pruning and under weeding, and if I left my tree alone as long as I had left the weeds in my pot alone, it was bound to improve. And it has! Plus, when I weeded my tree I found some missing pruning shears, a pair of pliers, and my favorite sweatshirt. Hope to see you all there. Meet and greet begins at 7 p.m., the meeting begins at 7:30. President’s Message: Happy New Year! Welcome to the new year, the club’s 47th by my count. I’m looking forward to a good year for the club. 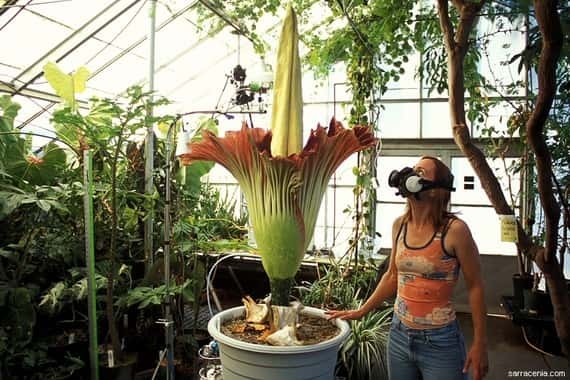 Our annual show’s long run at the Botanic Garden has come to an end, but we have found a promising new venue to replace it. Speaking of the show, it’s not too early to start thinking about an entry or two. We’ll have a lot of room and we’d like to see entries from all members, novice to advanced. Unfortunately, our annual December potluck, our farewell to 2017, had to be canceled, or at least postponed, due to the awful air pollution from the Thomas Fire. Watch the newsletter for a new date. Dues are due. We’ve had to increase them, darn it, but the club does need to pay its bills. And once again, a plea to sign up for the new semester of the Saturday workshops. 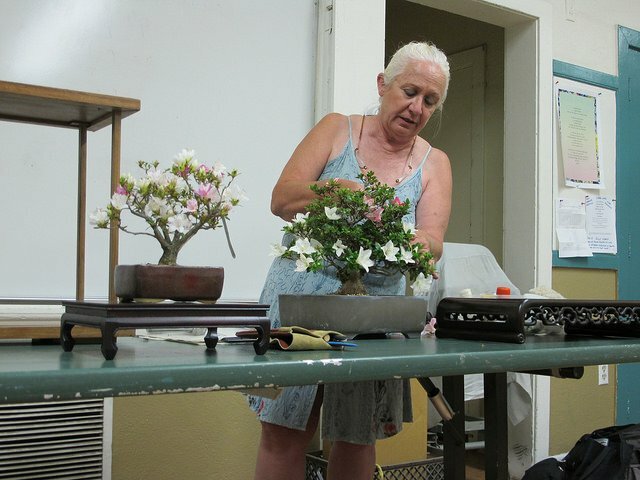 Our guest instructors are the best you’ll find anywhere – most of them are known throughout not only California but the whole US and beyond and they are willing to come here to help bonsai enthusiasts of all skill levels. Annual membership is now due. The $35.00 per year is used specifically to meet expenses for the GVCC meeting room and two or three outside Tuesday evening presenters. It’s also time to sign up for the SPRING WORKSHOPS that begin in January. 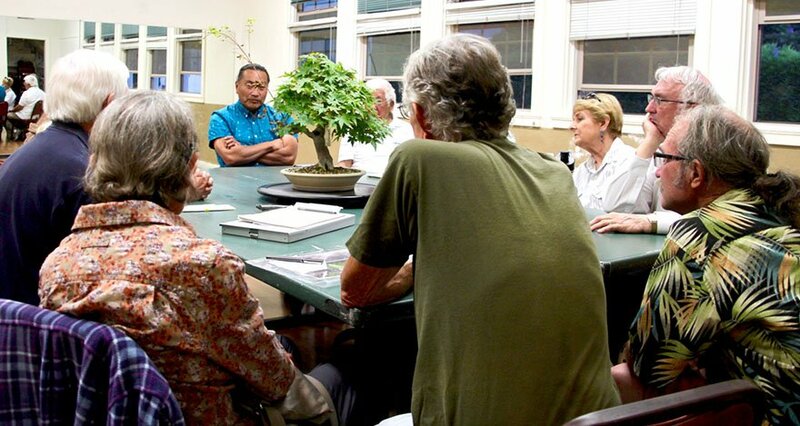 Four 3-hour sessions with a professional bonsai instructor dedicated to helping you design your trees for $120. There’s nothing like hands-on advice about pruning, shaping, wiring and displaying your trees. We have space for 8 participants in the Morning session and 8 in the Afternoon session, so please sign up early. I have included the renewal form with this month’s newsletter. More Great Trees From The Big Show! 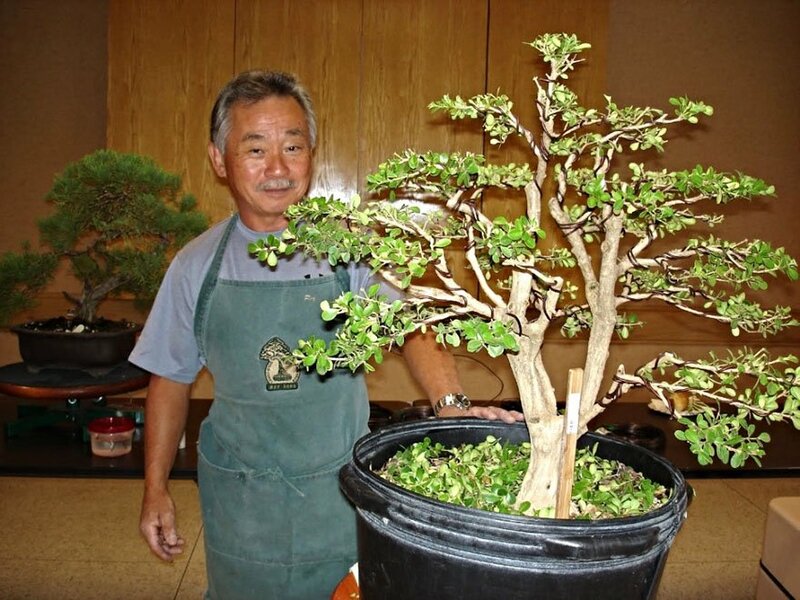 Last month I posted some beautiful trees from the recent Golden State Bonsai Convention in Riverside that Club President Joe Olson took. Here are a few more. The final grouping should appear next month. Thanks Joe! Bonsai-A-Thon XXII at the Huntington Library and Botanical Gardens, 1151 Oxford Road. This is the annual fundraiser for the GSBF Collection at The Huntington. Event admission is free with Bonsai-A-Thon “early bird” registration between 7:30 AM – 9 AM. Event hours are 8 AM – 5 PM both days. Pancake breakfast, demonstrations, lunch, bonsai exhibits, large sales area, raffle and auction. For more information visit www.gsbfhuntington.com This is the one show not to miss! Usually, one or more members of our Club have trees on display. 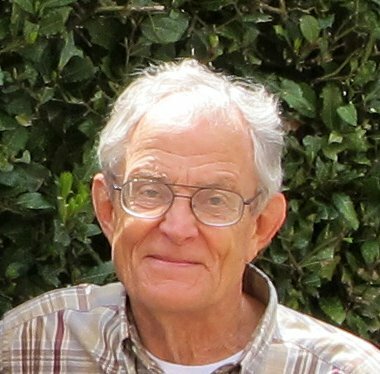 Also, most of the presenters and workshop leaders that come up to Santa Barbara to help us with our trees will be there, including the curator of the Huntington’s incredible collection in the Japanese Garden, Ted Matson. The vendor section features many trees and pots for sale are fairly reasonable prices. If you wear your badge you will get free admission to the show and to the entire garden for the day. No one submitted a tree for this month’s Member’s Trees section. I’m now taking submissions for the next issue. 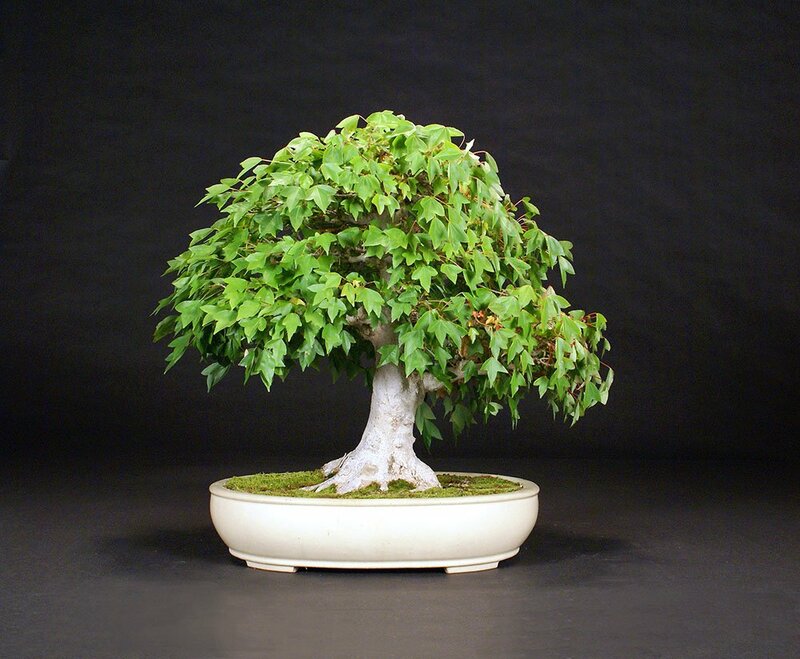 This is a nice opportunity for you to showcase one of your trees and tell us how it went from a pre-bonsai to a finished — if they ever are actually finished — tree. It gives the rest of us hope and inspiration for our trees-in-process.